Here we are again; the beginning of a new month. July. As we prepare to celebrate the birth of our great nation, I can’t help but feel that you guys really missed an opportunity not saving the American Flag wrapped rally monster for a more… obvious month… That said, I am thrilled to bring you the story of a boy (a punk kid, really), his RS and how he AWESOMELY made it his own. 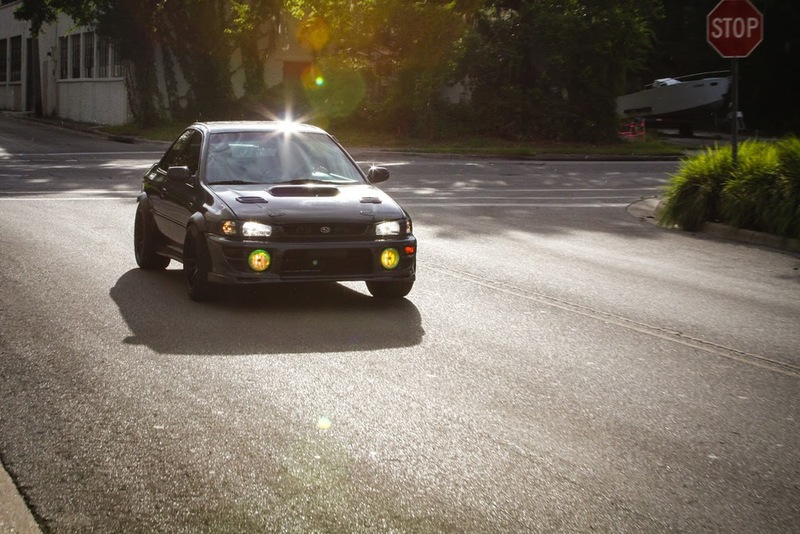 I met up with Josh Marshall at a defunct audio outlet in Gainesville for some pictures and to find out the story behind this beautiful 1999 Impreza RS coupe. Josh was born and raised in Starke and is currently attending the University of Florida, studying the business of sports. His journey in the automotive world started out with a Honda - a 1998 Accord coupe with an automatic transmission and, by his account, a “ricer exhaust.” He says he was intrigued by Subarus, watching them in X-Games, rally events and in internet videos, plowing through the mud. Josh somehow fell in with the now infamous NFSG Illuminati - Team Blue Falcon (that’s right, keen reader, we’re now four for four on articles about #TBF cars). One day in January, Josh mentioned to (previous featured member) Houston McClain that he would like to have a GC coupe. 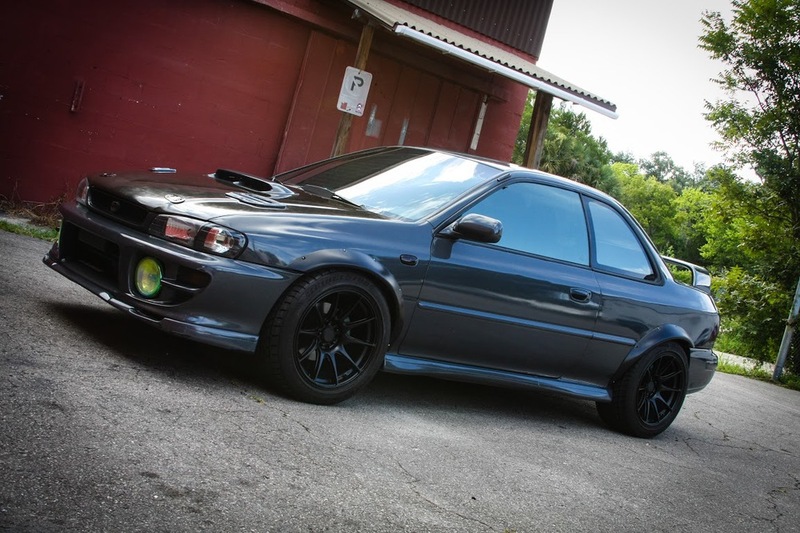 Within a week, Josh says, his current car was sold and he was on the way to Pensacola to collect the RS; his first Subaru. One of my favorite things about this car is also what makes it fairly rare in the NFSG. In a community where the factory turbocharged boxer is ubiquitous and several other RS owners have gone the swap route, this survivor from the “old school” retains the 2.5Litre Naturally Aspirated mill that it was born with. Spent gasses exit the N/A block through Borla header, a Tsudo mid pipe and Stromung axleback, which emits pleasingly low exhaust note. A SuperTech valvetrain and Delta 2000 cams under the rocker covers give the engine a lobey, uneven rumble at idle. It wasn’t until I asked for a couple shots of under the hood that I realized that there was no intercooler adorning intake manifold, as I had expected. Inside the cabin, front seats from a 2003 WRX and a JDM WRX shift knob provide a comfortable and functional driving experience. The classic lines of the coupe are swathed in a metallic gunmetal paint that reminds me of summer storm clouds rolling in from the west. A carbon fiber hood with 22B vents covers the engine bay. Further down the nose, Hella Supertones hide behind the center grill. A V5 STI lip adorns the front fascia, just below “power amplifying” decals. For the record, the “I LIKE THE TUNA HERE” sticker is still my favorite Paul Walker tribute. HID bulbs occupy the stock headlight housings and Chameleon vinyl (applied the day of the photo shoot) covers the fog lights. Let’s not ignore them any longer... the thing that stands out most when regarding the RS are the wheels and tires. Protruding slightly from below the 240ZX fender flares are massive 275/40/17 Potenza RE750’s. The tires hug black 17X9.75 +25 XXR 527 wheels. The most recent mod Josh made to the coupe was the cutting the fenders and rear quarter panels to accommodate the rolling stock. That sounds terrifying. 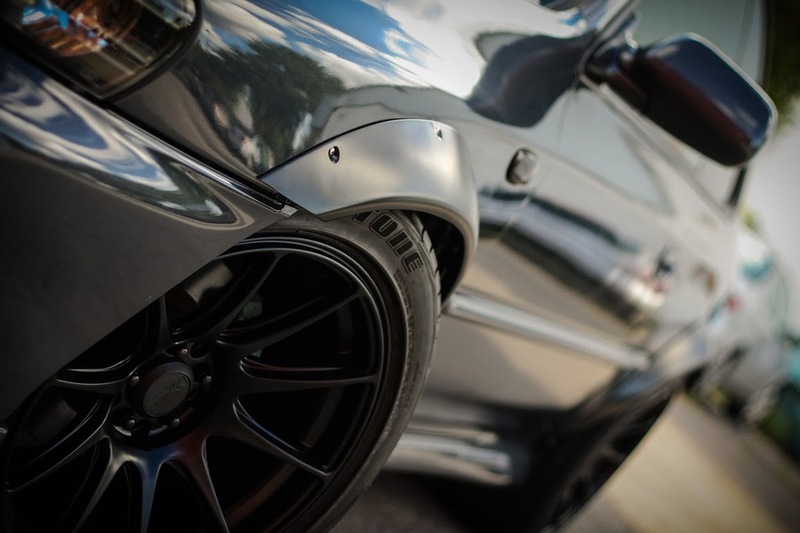 Bliestein struts and Prodrive springs keep wheel gap to a minimum and ensure static status. The finished product is polarizing, but I, for one, LOVE IT. It’s bold and modern, but without losing the old school charm of the GC body lines. I told you he was a punk. Thanks Josh, for being awesome and sharing your beautiful ride with us.